Bailey-Boushay House (BBH) became a home and a haven for Marie Dunn and her husband Michael, who had Huntington’s disease. For three years, he was surrounded by the Bailey-Boushay team that truly cared about him. “I love it here, everyone is so kind and they feed me well — the food is great!” he said. Michael passed away in 2013, but Marie remains part of the Bailey-Boushay community and continues to support its programs. “When Michael was diagnosed, I was warned that very few nursing facilities would even take Huntington’s disease patients,” notes Marie. “And, true to these warnings, Michael spent time in three separate facilities, which were unequipped to care for him and provide for his very unique needs. But Michael ultimately found his new home in Bailey-Boushay House. 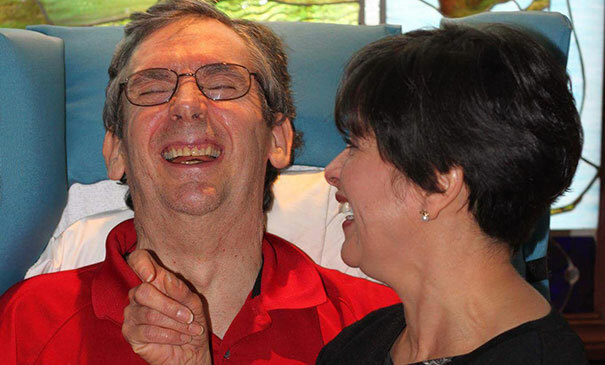 The staff there accepted Michael with no hesitation, telling us, ‘This is his home for as long as he wants to stay here.’ For the first time in years, I felt the burden lift – I wasn’t alone. I was surrounded by people who genuinely cared about Michael, who wanted to know Michael the person – not Michael the disease. That was the turning point and a recovery of some sense of normalcy, a chance to be husband and wife again, and not caregiver and patient.